It never failed to amaze me whenever I see older English gentlemen looking so dapper in their tweed jacket and colored trousers. The colors often ranged from plum, burgundy, tomato red to various shades of green. Instead of looking crass, the words that came to mind would be sophisticated and stylish. Never in a million years would I see such outfit in New Zealand where the relaxed lifestyle called for plain old t-shirt and jeans. Lately, I've been seeing denim in every color of the rainbow in stores, on the streets and blogs. Could it be that menswear has an influence on women's style? I've been on a hunt for the perfect red pair of jeans for a year now to no avail. If the color worked, the fit was terrible or vice versa. I was in London on Saturday to see a friend so I took the opportunity to pop into my favorite High St store, Uniqlo. The anticipation of finally acquiring colored jeans turned into disappointment when I noticed that the red jeans were in fact coral. 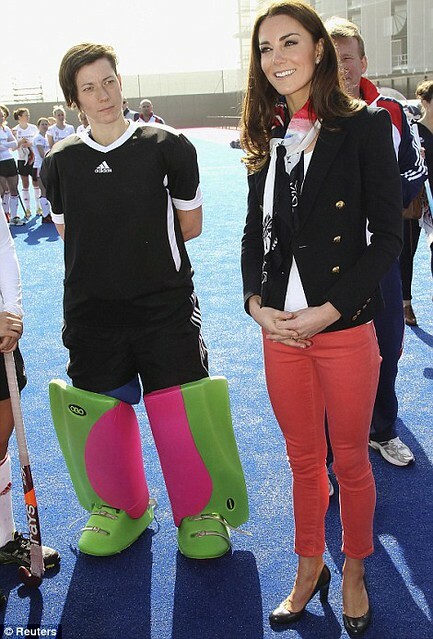 In hindsight I should've given them a go particularly seeing how great they look on Duchess of Cambridge. I'm easily influenced like every other person out there. After much thought, I settled on the safari green shade. Thanks to the advice of a reader, Estrella, I decided to stick to normal jeans and have them shortened to ankle length. Their cropped denim were made of pretty thin fabric and so tapered that my legs looked like stuff sausages. My wardrobe is noticeably lacking in colors which I hope to amend in the upcoming months. Has anyone started wearing colored denim lately? I don't do pastels very well. I'm with you about brighter colors. I love them! I have some Isabel Marant pink ones. Many of the ones around are just too orange. J Brand do great red ones. I've never understood where those old men get those trousers, there must be a coloured trouser shop somewhere on Saville Row. I think KMid looks really nice in that hoody and trainers. It's nice to see her wearing something vaguely young and fashionable for once. She looks like an air stewardess in the other one. And why does she wear all that awful make up? I wish I had really slim hips like those starlets. I can't imagine there is anything that wouldn't look nice on you, it would all be so easy! Hahahaha....I like her navy blazer but the combo kind of makes her look older than she actually is. I've tried the J Brand ones but they're way too low rise for me. The muffin top effect was pretty horrendous! Annie, I wish I'm as slim as these celebs. I've got slim hips but I'm not slender in any way. I love bright colored pants! I got a pair in cobalt blue early this year and just ordered another silk pair in purple-ish pink color. It is coming in the mail as we speak :). They lift up my mood on sad cloudy days for sure. I know what you mean. Seeing grey skies everyday is rather depressing. These bright colored jeans are definitely cheerful looking to beat the horrible weather. i love colored jeans. i found the perfect pink ones but waited too long to purchase them and they don't have my size. haha glad you started your collection M.
It's at the Ritz Paris. I'm loving the colored jean trend myself. I ordered a pair in "strawberry", which sounds/looks like a beautiful red and they should be here soon. I'm also looking for plum colored jeans like the ones Hanneli M features on her blog all the time but, so far, no luck. All I can find is bright purple. I'm not sold on the coral color myself either, Marlene. Does anyone know what bag the lady in the last picture is carrying? I AM IN LOVE. Again. You mean Olivia Palermo? She's carrying a Zara bag. I think they've brought it again in different colors seeing that she has made it so popular. I didn't notice it was Olivia. I guess I was too busy looking at the bag! Zara?! Wow, in the picture it looks like a gorgeous rich leather. Mee meee! I live in my deep plum colored Paige Denim ankle skinnies! I want cobalt blue or red next. Too fun! Plum!! Looks like you, Maria & I seem to have the same idea about colored jeans. I want a red and then a plum. What's the cut of the Paige denim ankle skinny jeans like? Theresa, I really need to break out in colors, to be perfectly honest. Where did you get yours? I have not seen different colors in jeans here...just traditional blue. I suppose when everyone is through wearing them in the states they will show up here! I may have to look at them when we go to the US for a visit in June. You definitely have better selection in the US compared to here, Alida. I only have one pair of colored jeans so far which is cobalt blue but also have a pair of trousers in hot pink. I think a safari green will be gorgeous! I am on the search for a mint on but have not had any luck, I don't want to spend too much either cause this trend will prob. be a short-lived one. Thu, I'll have to live vicariously through you. I can't do hot pink. Looks like everyone's looking for mint. Olivia Palermo's look is so pretty ! Emma, I love how you wear your pink jeans. Fantastic outfit. I love colored jeans! I just bought my first pair the other day and I'm looking to add more to my closet. It's pretty easy to obsessed and buy them in every color. I bought a few pairs and they are waiting for me to pick them and splash the city with colors! Don't forget to post them on your blog :) I'd love to see what you pair them with. I haven't seen teal ones. Gosh, I have no idea they come in so many different colors. I'm obsessed with coloured jeans right now too! I've picked up.. coral, yellow, red, and mint in the past week. Just gotta wait for it to warm up a little and I can wear them out! Wow! I'm impressed. Where do you get yours from? I tend to buy mine from Uniqlo but I'm not loving their color range lately. I have to agree! I've got a whole drawerful of normal denim. I think Zara has pastel ones if I'm not mistaken. I don't do pastels all that well. If I get any fairer, I'll start looking like Edward Cullen. Great news that Uniglo shortened skinnies have been effective, I need to set aside a morning to concentrate on H&M , Gap, Uniglo Esprit ...trying on loads of styles and colours . Because I also LOVE the coloured denim . I do like coral , red and grey, grey , grey . I've four or five pairs of Paige jeans .My friend in US got me into them and I grab them on Ebay and at Trilogy in the Sale. They seem to age really badly for expensive jeans , but when they're newish they look great . What a fab idea about shortening the jeans. I never thought of that. Now, I really need to rethink this stay away from colored denim. I think you have may changed my mind! I tend to buy normal length jeans and have them shortened so that they're more straight. The ankle ones are too tapered and hug the ankles in a tight grip. Not a good look for someone who's vertically challenged like me. I have plum and I'm looking for mint and pale coral this spring. My plum ones are from Rag & Bone. Definitely more than I wanted to spend for something so trendy but I've worn them to death this past fall and winter so I'm using a cost per wear analysis to justify them ;). I love the safari green shade you picked! Thank you, Chloe! I just wish they have darker shades. I would so love a pair of plum jeans. I love R&B but I don't know if I'm willing to fork out so much for colored denim yet. In the meantime, I'll see if they're cheaper alternatives around. i have been wanting colored denim for awhile, but found out that those non-dark ones typically make my short and stumpy legs resemble stuffed sausages...not a good look! i'm waiting to get jcrew's red minnie pants as the fit is slightly more forgiving for my sausages...er...legs. *sigh* I know what you mean. I wish I'm blessed with long lean legs. Oh well. It's wishful thinking. Haha!! I haven't tried color denim yet, but I love the safari green pair that you got! It took me years to try the skinny jeans thing so I'm sure I'll come around to it! I bought pastel yellow and light pink already. I'm supposed to stop at two. But I am always so tempted to get a raspberry pair (red is too bright for me). They just look good when paired with blue. Hi there, I'm sorry for the late reply. 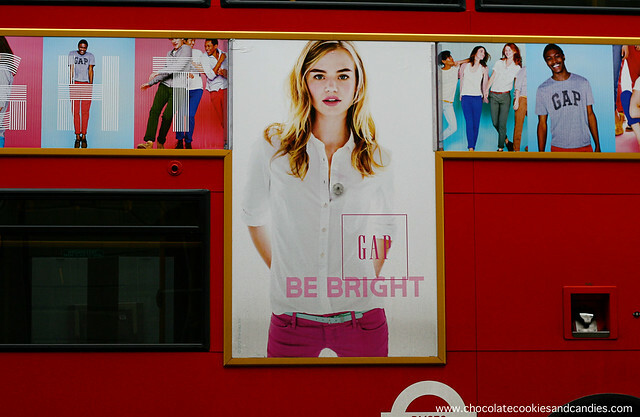 Unfortunately, Uniqlo isn't available to order online outside of UK.